We are excited to announce a change to the scoring of our annual 100 Best Companies to Work For in Oregon project to reward employers that achieve high employee participation rates. The majority of companies’ scores for our 100 Best Companies project, now in its 26th year, comes from an employee satisfaction survey, in which staffers rate their satisfaction with a variety of workplace practices. 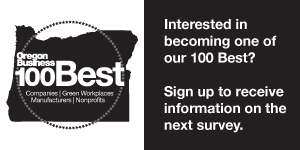 We are adding a 100-point score to participants’ overall score, which is used to rank companies in the 100 Best list, that takes into account the percentage of Oregon employees who fill out the survey. Employers that get higher than average participation rates for their size group will get more points than companies than get lower than average participation. We hope this new scoring will more fairly represent the efforts of employers that manage to get a high proportion of their employees to participate in the survey. The new scoring methodology will be implemented for the 2019 100 Best Companies to Work For in Oregon survey, which launches on August 14, 2018. If you are interested in participating, you can register on our website from the date of launch at www.oregonbusiness.com.